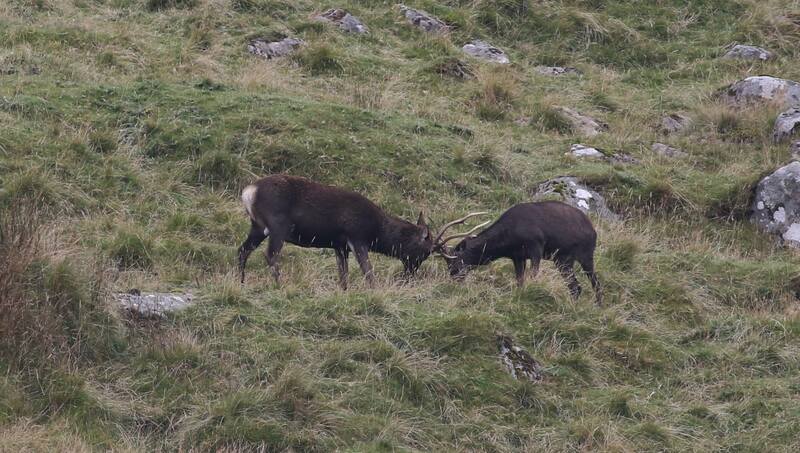 The rut is well under way across Wicklow at the moment as Stags seek out their female counterparts. Wicklow see’s some of the highest deer related car accidents at this time of year. The National Parks & Wildlife Service are reminding drivers to watch out for deer particularly at dawn and dusk. When you see deer warning signs, check your speed and stay alert. If your headlights are on, use full-beams when you can; but dip them if you see deer as they may ‘freeze’. Be prepared to stop. Try not to suddenly swerve to avoid a deer. A collision with oncoming traffic or another obstacle could be even worse. Do not approach an injured deer – it could be dangerous-Report to the Gardai. If you collide with a deer (or witness a collision) and someone may be injured, or if vehicles or deer in the road are a risk to road safety, then you should report this to the Gardai. Deputy Regional Manager, National Parks & Wildlife Service.. NOTE for Photographer’s and Hillwalkers…….Deer are wild animals, even in the parks. They are also large and can potentially be dangerous if you try to get too close, are caught between rivalling stags or a male and his hinds. Be cautious, take your time. Evaluate the scene, look for the dominant male and assess a route for approach. Move directly towards your subject, using trees and ground for cover, stopping regularly to assess your subjects response. If they seem startled at all, wait or move away. An image is never worth your subjects distress.